Why are Anime DVDs so Expensive in Japan? Many of us have had this experience; we are at a convention and we get really excited because we see the Japanese release of our favorite show, and our inner Otaking screams we must have it and rush towards a booth, lift the box with reverence and gaze on our prize, and then almost faint as we see the $75-$90 price tag, and that just for the first 3 episodes. Perhaps your experience wasn’t exactly like that, maybe it was more of an online moment. Perhaps your curiosity was just piqued and you searched for it then quickly closed that browser tab and never looked back. The fact is that anime DVDs and BDs are expensive in Japan, really expensive. To understand why you have to look at how broadcast television works for anime in Japan as opposed to America. In Japan, late night anime time slots are bought and sold in a way similar to infomercial airtime in America. First, the producer of the show gathers up like-minded people and investors that could benefit from a show and forms a Production Committee (Seisaku Iinkai for those interested in the Japanese term). This group pays the television network for the time slot, basically for the privilege of airing the anime. 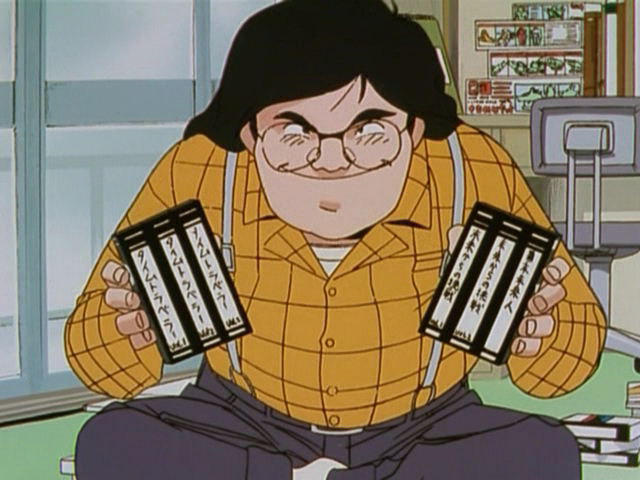 Some money is made back by some limited sales of ad time during the show, but for most part money is made on the back-end through DVD and BD sales. Longer, more well-known franchises also make money through other merchandise sales such as figures and model kits, but for shows that are only one or two cours (12-14 episodes) in length merchandising is not a viable option. This means that for a short run show, the few thousand copies of DVDs that are sold are the only way the production committee recoups its losses. In essence those few thousand fans pay for the entire production of an anime. This is wildly different from how American-made television series are bought and sold. Shows are generally paid for and sponsored by the network airing them and the network recoups almost all of its money through ad sales. When the various disc formats are released, those sales are almost pure profit on a show that’s already been paid for. This setup suggests that Japanese creators might have more control of their shows, because the people fronting the money are the creators as well as the investors they have found (the production committee). Whereas in America the creative is essentially hired by a television network to produce a series oftentimes leaving creative issues in the hands of executives, where a creator’s vision may be changed because of perceived market trends or even cancelled (Firefly anyone?). But because of this setup many studios have to “play it safe” by producing an anime of an existing franchise with an established fan base; often times this is a manga, but more recently light novels and video games are being used. Even studios like Gainax and Trigger which are well-known for their original content will produce shows like this in order to “pay the bills” and fund their more ambitious projects. This entire setup was much of the cause of Bandai pulling out of America in 2012. Americans in general refused to pay the kind of money for discs that the Japanese fans were. This, combined with Bandai refusing to come to terms with online streaming made them decide America was not worth it. It is important to note that Bandai has since done a 180 on their stance on streaming. There are more Gundam shows available legally and simulcast in America than ever before. But things finally look like they may be changing in Japan. As of September Netflix has finally arrived on their shores and streaming seems to be the inevitable endpoint for how the world consumes media. There is even anime available; Psycho-Pass 2 season 1 and both episodes of Little Witch Academia. It will be interesting to see how streaming affects the anime industry, but my opinion is that it can only be good for the creators. For those interested in learning more about anime production, check out Justin Sevakis’ article on the Anime News Network. It is from 2012 so it’s a bit dated, especially the parts about streaming, but worth the read. If you want to know more about the “Bandai Incident” check out the Anime World Order podcast, episode 103. Categories: Uncategorized | Tags: animation, anime, japan, media | Permalink. If you have ever attended a sizable anime convention, or one that has a heavy focus on AMVs (anime music videos) there is a chance you have witnessed this strange and exciting compilation/mix tape of anime, music, and lewd comedy. And as the convention season begins to slow down and I find myself fully recovered from Anime Week Atlanta I am reminded that last year was the first time several of my friends had seen an AMV Hell, and while many people get a good laugh out of it I wondered how many fans actually know what it is and the history behind it. If you haven’t heard of it before it can be a bit difficult to explain, perhaps you should watch the original and come back, I should add a spoiler alert as well. So, what is it and how does it work? The easiest explanation is that it is a fan-made AMV mix tape intended for comedy, a more drawn out explanation is this; AMV Hell is a compilation anime music video that relies on one of two methods to get to the punch line. Either it takes a normal song with strange lyrics and uses an anime clip to interpret the lyrics literally, or it pairs a strange song with an equally strange clip. Of course this is not always the case, especially when the clip becomes self referential. For those interested in the full story as told by the creators, I will provide a link at the end of the article. But the succinct version is this; The original AMV Hell began in 2004 when two online friends – Zarxax and SSGWNBTD – began collaborating on humorous short clips of anime mixed with songs. From this AMV Hell and AMV Hell 2 were created simultaneously. AMV Hell 2 was for adult content and spawned its own line of offensive/sexual material, but the original was intended for convention audiences (according to the creators). It premiered at the 7th Animazement (which happens to be a local convention here in North Carolina) and from there took off. The process of producing AMV Hell is arduous to say the least. As it became more popular the creators put calls out to other anime music video creators to contribute. The intention was to have a year long creation and vetting process for each AMV Hell that was created, but like most people, anime fans are procrastinators. According to Zarxrax submissions would not show up in force until a month before the deadline which caused no end of headaches for both creators. Last year at Anime Weekend Atlanta 2014 was the premier of AMV Hell 7: Attack on 10 Year Anniversary. And as of May 3rd of this year Zarxrax has stated that it was very likely the final one. Will there be more Hell? What are your experiences with it? Categories: Uncategorized | Tags: animation, anime, fandom, geeky, japan | Permalink.